“My love of working (playing really) with fabric & threads began when I was a little girl, & I learned how to embroider. I had seen table covers & doilies that my Mom had from her Mom & Grandma, & I felt such a sense of belonging as I was also learning to do the variety of pretty stitches. I could sit & stitch for hours! 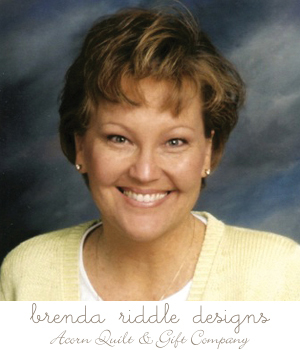 After 22 years working in the architecture, design and teaching fields, Brenda decided to follow her own design dreams and started Acorn Quilt & Gift Company. She first focused on quilts, & over the years has added designs reflecting her love of embroidery & counted cross stitch under ‘Brenda Riddle Designs’. Brenda majored in environmental & graphic design and has worked in the interior design field in Santa Barbara, California & in Minneapolis, Minnesota. She now lives in Oro Valley, Arizona, where she loves to spend much of her free time designing quilts and needlework, & designing fabrics for Moda(! ).